But mention “revenues” in this town and you trigger the attack of the NASTIE’s (Never-A-Stinkin’-Tax-Increase-Ever!). Share the post "Attack of the NASTIE’s"
16 comments in reply to "Attack of the NASTIE’s"
Just a general comment: as a noneconomist, I’m so happy to have your blog, written in English and even with a sense of humor. Keep puncturing the pretensions, the misinformation, and the ignorance! Someday we’ll break through–right? I should look at what you’re doing now so I know what I’ll be plotting in 2 years. Some of this may reflect the redistribution of wealth that occurs when progressive/regressive tax rates are adjusted as under Bush. The last time so much wealth was concentrated in such a small percentage of the population was 1927 – and guess what happened then. I don’t think it is a coincidence that we are experiencing such a deep recession now. This is just one part of the equation. In an economy so depandant on consumtion, a large pool of people have to have money to spend in order to grow the economy. The subsitance service jobs that are so prevalent today just don’t cut it. Nobody ever discusses the Alternative Minimum Tax impact. This tax was not adjusted in 2001 to reflect the Bush tax cuts. It caused the bottom end of the so called wealthy (ie. small businesses) to experience no impact via tax reductions. The 25% tax rate still paid 28% in most cases, becuse of the AMT. Most of the benefit of these reductions occured at the very high end of incomes, because they were already at the high end of the tax rate and had the wealth and resouces to get the most out of tax loophools. No one ever mentions AMT. I don’t really see what this is supposed to teach us. Tax levels are not the sole determinant of growth, with plenty of other factors also at play: regulation, monetary stability, tariff levels, rule of law, corruption, quality of human capital, etc. In order for this to be truly informative we would have to plot growth rates against tax rates with all other factors held constant. Plainly this is not the case. 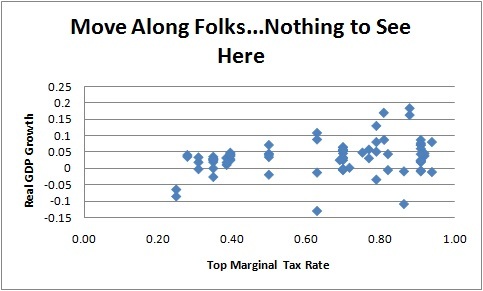 Further, tax rates aren’t always a good proxy for the tax burden. High rates combined with numerous deductions and credits can substantially lower that burden. Lastly, look at the income levels where the rates hit. If the top tax rate hits people making $5 million and up, that’s quite different than one which hits those making $200K and up. It would interesting to see GDP growth and/or unemployment vs Tax REVENUES, to avoid tax expenditure and other tax avoidance problems. This is terrific but I can’t quite believe your implication: that there is in fact little in the way of serious econometric research on the topic. Supply side economics has stimulated the the key economic policy debate of the past 30 years, yet you’re suggesting that there isn’t a well-developed empirical literature on whether tax cutting really stimulates GDP growth and employment? I’m just a political scientist but it seems remarkable that the best we have are anecdotal comparisons of Clinton vs Bush II or, now, your blogometrics. I’m skeptical that anyone in DC has the guts to lay out the 25 largest exec bonuses in the US last year (I myself don’t have the data). I assume it would reveal hedge fund managers for some of those 25 spots, as well as the CEO of United Health Care, who IIRC made over $75,000,000. In my limited experience, people tend to be anti-tax, until they start hearing about the extravagant numbers of CEO bonuses and exec pay — recall, if you will, the hullaballoo regarding BP Tony Hayward’s golden parachute a year or so ago. That ticked off even the right-wing, anti-taxers of my limited acquaintance. Reagan talked about ‘tax cuts’ in an era when the Tony Haywards and the hedge fund managers were not controlling so much concentrated wealth. Helping people grasp the simple fact that what Reagan talked about, which is to their minds as ‘obvious’ as Biblical truth and just as sacred, does not apply in an era of $75,000,000 paychecks would truly be a public service. Thanks so much for your insightful blog-it’s refreshing to see this informal “conversation” take place in an intelligent and lighthearted way. I have one question about what seems to be your implication that elevated top marginal tax rates are correlated with periods of robust GDP: Are you suggesting that raising top marginal tax rates causes robust GDP growth or the other way around? Put another way, I can imagine that in times of relative economic prosperity the raising of taxes to recoup revenue makes sense, but I don’t see how raising taxes per se drives GDP. Thank you in advance. I’m definitely NOT saying anything about causation, one way of the other. I’m explicitly saying in the blog that there are many moving parts to this at it’s often very hard to isolate the growth and job impacts of tax changes (some things, like shifting the timing in the sale of an asset before an increase of a tax on that sale are much more obvious). In fact, my point is that the NASTIEs view of causation–any tax increase of any amount at any time will tank the economy–is clearly wrong. Correlation doesn’t prove causation. But lack of correlation should make the causation argument a very heavy lift! Regarding a healthy economy, my friend has said to me, “Chalking things up to tax policy seems a bit myopic to me.” I should send him this blog post. Do you think we’ll ever get back to Eisenhower’s tax rates? I certainly hope so because it seems they would produce a balanced budget. On the other hand, James Galbraith has said that balanced budgets produce recessions. Do you agree? What years does this cover? Not 1789 to the present I surmise. It also reflects the best data for your point of view from the PRE-GREAT SOCIETY ERA, i.e., before Democrats acutely used taxpayer dollars to buy votes and contrive political contribution kickbacks. Sorry–should have said that: 1930-2010. Thank you for publishing this. I believe that you will find that a time-shifted plot will show even greater correlation, even if we leave WWII out of it. 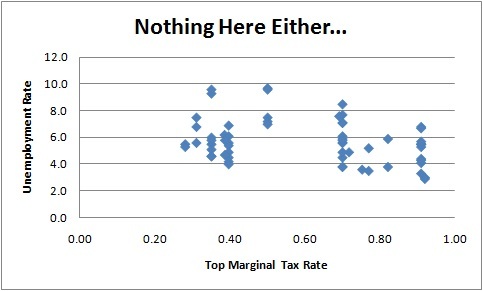 Plot top tax rates against GDP growth or unemployment *one or two years later*. If there is a cause-effect relationship it’s reasonable to expect that it may not have its greatest effect in the current year. The effect decreases after the second year, which has the greatest correlation. Punitive marginal tax rates on high incomes from 1951-82 produced much more tax avoidance, but less revenue. From 1951 to 1963 the lowest individual tax rate was 20-22% and the highest was 91-92%, but revenues were only 7.8% of GDP. The revenue yield rose to 8.1% of GDP under the Kennedy tax cuts of 1964 to 1981 (rates were 14-70%), and to 8.3% under the first Reagan tax cuts of 1982-86 (rates were 11-50%) and then to 8.4% of GDP in 1988-90 under the tax reform rates of 15-28%. The “elasticity of taxable income” is demonstrably very high among high-income taxpayers, particularly with respect to capital gains and dividends. Revenue windfalls from lower tax rates at the top(particulalry on capital gains after 1997 and also dividends after 2003) is what financed the doubling of personal exemptions and huge increase in the standard deduction in 1986, and the repeated expansions of refundable earned income and child credits in recent years. The U.S. tax system has never before been as progressive as it is today; no OECD country is even close to matching the U.S. in that respect. But flatter systems (15-28% versus 10-35%) yield more revenue with the least distortions and disincentives. The unprecedented 10% rate of 2001 (the lowest since 1941), is a flat $850 grant to the top half and loses a ton of money with no offseting behavioral impact at the margin. If one is really looking for revenue, the Eisenhower approach will not work. Dogma requires no research, in fact dogma abhors research. Sadly, this is also where I think Mr. Bernstein’s conclusion, that the NASTIES will have to come up with some other justification, fails as well. The reasons they have have worked for 30 years, for their purposes. They have no incentive to change. They have raised a generation of politicians and voters who take it as an axiom that lowering tax rates == growth.